Should effects go in subpatches or main patches for polyphonic synths? 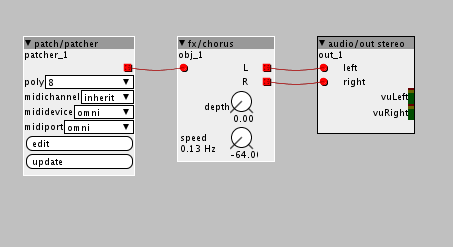 Lets say I'm making a 4 voice polyphonic synth with chorus. I know I can put the chorus in a voice subpatch with all the oscillators and whatnot, but does this mean there will be 4 instances of the chorus running? If so, I think it be more efficient to just have one instance of the chorus object in the main axoti patch and all the oscillators and mixers and whatnot in the voice patch. Is this possible to do? sure, just take the output of the polyphonic subpatch and run it into the chorus and then to the output. woa sweet! how do I do this magic? Is there an example somewhere? It shows how you can make polyphonic patches. ahh, K i figured it out. I added a patch/polyindex object into the subpatch voice object thing and then clicked update and it added the poly dropdown menu to the patch/patcher object. Huge results too. My synth was maxed out at 5 voices, not it does 16 no problem YEEEEEEY! click "edit" on the patcher top open the subpatch. Make sure you have not selected any object and then go to dropdown menu "view" and select "settings". In settings set subpatch mode to "Polyphonic" and select "has midi selector".